*Early Bird Discount Expires 1st February 2019. Applications can be made on our online application page. Summer camps with Habonim Dror = fantastic memories and so much more! Here at Habo Dror, we are proud to run the greatest Jewish Summer Camp in the UK! Recommended by 97% of past participants – there’s a reason why everyone says that a Habo summer is the best summer! Fun, friends and so much more. We have been around for 90 years and we still strive to make each of our summer camps bigger and better than the last. Murder Mysteries, Habolympics, an engaging theme and, of course, the classic tiyul (hike) experience make a Habo Machaneh a must-do activity for every Jewish child. Our summer camps combine time on mainsite with a tiyulim (hikes) in the beautiful countryside in groups of 10-12 people (kvutsot). Weather permitting, and dependent on the age group, these traditionally last between one and four nights. This creates the perfect opportunity to make new friends and have a unique camp experience, sleeping under canvas, cooking your own food and having a real adventure. Once at mainsite the fun continues on our secure sites. You will have the summer of a lifetime with Habonim Dror and that is why everybody just keeps coming back for more! For full information see the brochure below. We operate a waiting list to take account of any cancellations – you can find further details or place your child’s name on our waiting list here. Socialist, Zionist, culturally Jewish Youth Movement, Habonim Dror has been at the forefront of Jewish education in the UK and internationally for almost 90 years. Habonim, “The Builders”, was created in 1929 in the East End of London, to create a space for Jewish children to gain a strong grounding in Jewish culture and the importance of Israel as a focus for the Jewish world, with chaverim going on to establish a number of kibbutzim in Israel. Dror, “Freedom”, was formed in 1915 by the secular pioneers of Russian Zionism, who were later on the frontline of the Jewish underground in Poland, participating in the Warsaw Ghetto Uprising. With the formation of the United Kibbutz Movement in 1980, the two youth movements united and Habonim Dror, “The Builders of Freedom” was born. Graduates of HDUK include Sacha Baron Cohen, David Baddiel, Mike Leigh, Baroness Deech, Tony Judt, Jonathan Friedland and Dan Patterson. Graduates of HD worldwide include Golda Meir, Seth Rogen, Stanley Fischer and Mark Regev (Ambassador of Israel to the UK) to name but a few. Today, Habonim Dror operates in over 20 countries from Argentina to Zimbabwe and still holds true to the aims and values of educating and inspiring Jewish youth that have been at the core of the movement since its conception. We aim to create a culture and educate based on our worldly values of equality, and empower Jewish youth to take responsibility for their Jewish and Zionist identity, the Jewish people, Israeli society and the world at large. 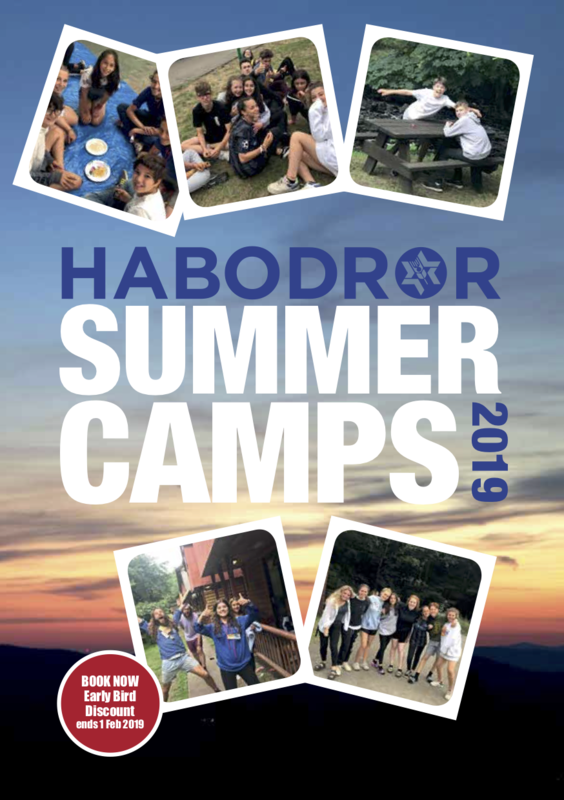 Our activities at Habonim Dror UK reflect these ambitions, through our regular Ken activities across the country, residential weekends, day-schemes, school clubs, hadracha (leadership) courses, Israel Tour, our Shnat (gap year) programme and of course our Summer Machanot (camps). Machaneh (summer camp) is the highlight of the year for our chanichimot and madrichimot; a place where life-long memories and friends are made, endless hours of fun are had, and magical Habo nights are spent singing around the campfire. Alongside all of this, on Machaneh we endeavour to take our Chanichimot on an experiential educational process using innovative techniques and methods of informal education to give chanichimot (participants) their own space to learn and explore things in their own way. Our experiential methods of educating our youth include: group discussions and sichot (conversations), skits and role-plays, interactive and immersive activities, games and many other stimulating and thought-provoking activities which have all been carefully created by our own madrichimot in the run up to Machaneh. We run a unique camp-wide Shabbat service, which allows for chanichimot (participants) across all year groups to feel connected to Judaism, to each other and to the movement as a whole. At Habonim Dror we work hard to create a unique inclusive atmosphere that makes our Machaneh (summer camp) a home away from home for every child. We work especially hard to ensure any first-time campers are made to feel welcome and integrated into their groups. Our Madrichimot (leaders) are all fully-trained and well equipped to lead on Machaneh (camp). Habo Dror has a rigorous hadracha (leadership) course which begins on Israel Tour. Our Madrichimot receive year-round training in education, welfare and a wide range of leadership skills. Habo Dror seeks to educate the next generation of Jewish Brits into becoming tomorrow’s strong and courageous leaders. The informal and dynamic youth movement environment allows for their empowerment, self-realisation and ultimately, the moulding of inspiring and responsible leaders. On arrival at camp, chanichimot will be split into smaller kvutsot (groups) of around 10-12 girls and boys, accompanied by 3-4 madrichimot (leaders). These groups will be mixed, allowing chanichimot to bond with new people, as well as rekindling old friendships. The kvutsot remain their ‘camp families’ for the duration of Machaneh. Weather permitting, all our chanichimot will experience a tiyul (hike) at some point during Machaneh. This will vary in length from one night for the youngest up to four for the older ones. In their kvutsot, the chanichimot travel on foot from one campsite to the next, breaking throughout the day for activities or relaxation. They will enjoy picnic lunches in the local villages, country parks or beaches. During this time, they get the opportunity to participate in varied outdoor activities, such as visiting funfairs or playgrounds and spending time on the beach where possible. During tiyul, the chanichimot sleep in tents and prepare their own meals. They enjoy barbecues and traditional Habonim Dror campfire singalongs. Tiyul is truly the most unique of all Habonim experiences… Years later, people still talk about tiyul as their favourite Habo memory. In the unfortunate event of Tiyul being rained off, chanichimot will return to the safety and warmth of Megasite where the madrichimot endeavour to recreate the Tiyul atmosphere. Chanichimot (participants) in Years 5-9 share the accommodation at the Habonim Dror Megasite in South Wales. This is a secure 100 acre site in the Welsh countryside with a river running through it. Sleeping accommodation is split between small cabins and larger dorms. There is a 10,000 sq ft hall, alongside a number of other activity rooms for when the Welsh weather is being less kind to us. Megasite houses four of our summer camps for ages 9 – 14. This enables the chanichimot to be part of a huge Habo Machaneh experience whilst also engaging in separate activities with their peers tailored specifically for their particular age group. Habo summer camps always involve largescale fun activities such as a Colour Wars, Murder Mystery, Habolympics and camp fires. Chanichimot also have fun whilst learning about Habonim Dror, Israel and their Jewish identity and values. Informal education is at the forefront of everything we do as a youth movement. Our carefully planned tochnit (themed programme) develops a positive and rich Jewish identity in our chanichimot, which enables them to understand and appreciate our Jewish heritage and culture. Each year we have a specific tochnit that is the main focus of our peulot (activities). The last few years have seen themes such as ‘rebellion’ and ‘identity’. Last year’s was ‘freedom’, where we explored such concepts as freedom of speech, societal and religious constraints and modern day slavery. The theme will always be tackled in different age-appropriate ways throughout camp. Each day the girls and boys take part in creative sessions run by the madrichimot who have undergone extensive leadership training and spent considerable time preparing the activities. Efrochim provides the first opportunity for chanichim to experience a Habonim Dror Machaneh, with a week-long residential camp. The Efrochim tochnit (programme) is the perfect introduction to Habo Dror, run by madrichimot who have been specially trained. They ensure that the children are well looked after and that they get the most out of their first Machaneh experience, whilst also having their first taste of Habonim Dror’s creative and fun ways of learning. Coming together with chanichimot from across the country, the girls and boys will be able to build new friendships, in our warm and inclusive atmosphere, that will last for many years to come. Mid-way through camp, the chanichimot go off on a hike with their madrichimot where they will camp for one night under canvas. During this nine day residential camp, chanichimot (participants) will be eased into the unique culture of a Habo Dror Machaneh, whilst being immersed in a fun and stimulating tochnit (educational programme) and meeting up with old friends and new. The chanichimot split into smaller kvutsot of around 10 children for tiyul, accompanied by at least three fully trained madrichimot. Hiking through the stunning Welsh countryside for three days, being introduced to the famous Habo ruach (spirit) and singing around the campfire makes for a fun-filled and adventurous addition to camp. Back at Megasite, the chanichimot are introduced to the camp’s creative tochnit as well as experiencing some of the traditional peulot (activities), including the legendary Murder Mystery and Colour Wars games. This two week long machaneh includes (weather permitting) a three or four night tiyul around the picturesque Welsh countryside with their newly formed kvutzah. In groups of around 10, accompanied by at least three fully trained madrichimot, the chanichimot will have a real Habo adventure – hiking, sleeping under canvas, and singing songs around a campfire with old friends and new. On Megasite, the chanichimot are introduced to the camp’s creative tochnit as well as experiencing some of the well-loved fun peulot (activities), including the legendary Murder Mystery and Colour Wars. Chanichimot enjoy their final UK-based Machaneh with a four night tiyul around the picturesque Welsh countryside with their kvutzah. In groups of 10-12, accompanied by at least three fully trained madrichimot, the chanichimot will have a real Habo adventure – hiking, sleeping under canvas, and singing songs around a campfire with old friends and new. On Megasite, the chanichimot are introduced to the camp’s creative tochnit as well as experiencing some of the traditional peulot (activities), including the legendary Murder Mystery and Colour Wars. Described by a leading Jewish educator as “the premier Holocaust seminar for teens in Europe”, Sayarim offers chanichimot the experience of a lifetime before next year’s Israel Tour. This is a well-renowned camp across the generations and always one of the most popular – a real highlight of chanichimots’ Habo journey. Based in Holland, chanichimot will begin their journey in learning about the Holocaust and its place in Jewish history – in what promises to be an unforgettable and meaningful experience. The tochnit (educational programme) helps chanichimot of all educational backgrounds to engage in discussions with one another about the Holocaust and how it affects us today. As learning about the Holocaust can be very intense, we recognise the need to maintain a balance for the chanichimot on Sayarim. We therefore ensure that each day includes lots of fun, traditional Habonim Dror peulot (activities) including the legendary HDUK Murder Mystery, Habolympics and Colour Wars. Chanichimot will also be treated to a day out at one of the biggest theme parks in Europe. We take advantage of the Dutch sunshine and run as many activities as possible in the beautiful fields of our long-standing site. As with the other Machanot, Sayarim includes a four night tiyul, exploring the Dutch countryside and enjoying the usual campfire ruach. For full information about our month long Israel Tour please click here. When asked “Would you like to come to Habo summer camp again”, 97% answered YES. Download the Summer Camp Brochure here. Apply online for Summer Camp 2019 here. What does a typical day on camp look like? There is no such thing as a ‘typical day’. However, each day will consist of a number of educational peulot (activities) as well as kef (fun) peulot. Each day includes some ‘free time’ where chanichimot can relax with their friends. A number of special traditional activities which have become synonymous with Machaneh will also be run for chanichimot over the course of their camp, including Colour Wars, Habolympics, chuggim (a choice of activities), camp fires and the legendary Murder Mystery. What happens if my child is unwell/in case of emergency? Fully qualified medics are present at all times for the duration of camp. There is also a Welfare Officer on Megasite. All madrichimot are trained to deal with basic first-aid and welfare issues, with Roshim (heads of camp) having received extensive welfare training on such matters as physical and/or mental issues to homesickness and first periods. Please be assured our madrichimot are prepared for any problem that may arise during camp. It is important to us that your child is in the safest hands possible on a Habonim Dror Machaneh. Can I contact my child while they are away on camp? In order to encourage chanichimot to be fully engaged, not only in our activities but also in their own social activities, Habonim Dror Summer Machanot operate a strict no-mobile phone policy. This also ensures the safety and security of all those involved as it would be impossible for us to monitor their social media activity. It minimises the potential for homesickness, as well as eliminating the risk of phones being lost / damaged. Each chanich/a will be encouraged to make at least one phone call home during camp, and if they wish to call home in addition to this, they are very welcome to do so – they just need to ask their madrichimot. Please understand that some children also opt not to call home – take this as a good sign. Our team of movement workers are contactable 24 hours a day in case of an emergency and we ask parents to support us in enforcing the no-phones policy in order to ensure all chanichimot are in the same position. Who will be looking after / running activities for my children? Each camp has its very own tzevet (leadership team) of between 10 and 15 madrichimot (leaders). The madrichimot on each tzevet will consist of a mixture of ages and will represent a balance of genders. Every madrich/a has been DBS checked. Each tzevet will be led by two Roshim (heads of camp) who are responsible for organising their tzevet and ensuring their Machaneh is running smoothly and efficiently. Roshim will also ensure that any welfare issues that arise over the course of Machaneh are dealt with swiftly and appropriately – so that every camper is a happy camper. Each camp will also have designated rakazim (organisers) who are responsible for overseeing the logistical needs of the camp, as well as making sure the camp’s kitchens and store rooms stay fully stocked. There will also be movement workers (full-time employees of Habonim Dror) on Megasite for the duration of Machaneh, who are fully contactable should any emergencies arise over the duration of camp. Who is cooking the meals? This year we are employing a team of experienced kitchen staff to prepare the meals for the children. There will be a nutritious and varied vegetarian menu plan in place. There will always be water, squash, fruit and biscuits available throughout each day, and ample quantities of food will be prepared for each meal so the children should never go hungry. If your child has particular foods they will not eat, please mention this in the application form. Will I get updates from the madrichim? We send a couple of email updates each week to parents, and each camp will post some photos on our Facebook page every few days. We aim to get as many photographs as possible, but the priority for the madrichimot will always be the care of your children, so whilst they will aim to document the camp as well as possible, it might not always be the case that your child will appear in the photos on Facebook. We ask you to be assured that no news is good news and remember the days before social media and 24/7 contact. A non-refundable deposit is required to secure your child’s place on summer camp 2019. Places cannot be reserved without a deposit. The discounted rate is valid until 1st February 2019. Applications and deposits received after this date will be charged at the full price. 10% discount can be given on your younger children’s places if you have more than one child attending summer camps. All fees due must be paid in full by 30th April 2019. Habonim Dror reserves the right to impose a surcharge in the event of circumstances beyond the control of Habonim Dror. All camp prices as stated throughout this brochure constitute a fully inclusive camp package – including insurance and arranged travel from Glasgow, Leeds, Liverpool, Manchester or London. If you wish to travel from a location not included in this list we ask you to let us know as early as possible so that we can discuss the options. We have a unique group kitty system as a means of realising our belief in equality. Under the guidance of the madrichimot, the chanichimot make shared decisions, promoting group bonding, mutual respect and trust. The money is spent on extras that are not included in the programme, and your child will not need any extra money. We are proud of our socialist ethos and believe that no child should be deprived of a Habonim Dror experience due to financial difficulties. We have a bursary fund which enables us to assist chanichimot who would otherwise be unable to attend. If you require financial assistance, please request a bursary form on the application. If you are in a position to do so, please consider a donation to our bursary fund to enable us to continue this important aspect of our machanot and events. For more information please contact Robert Berman on 0161 795 9447 or email robert@habodror.org.uk. Cancellations made before Friday 30th April 2019 will result in the loss of the nonrefundable £125 deposit. No refund can be given for cancellations made after this date, unless due to exceptional circumstances. Insurance is included in the price of camp. Full details of our insurance policy is available on our website or upon request. Should you feel that our policy is not satisfactory we advise you to take out your own cover. We take security into careful consideration, working closely with CST. For more information please look on the website. Habonim Dror is a culturally Jewish youth movement. We are not affiliated to any synagogue, but are committed to exploring our Jewish identity and celebrating Shabbat in a creative and meaningful way. We strive to ensure that all meals constitute a balanced and healthy diet. Habonim Dror UK now operates a vegetarian / pescetarian food policy on all residential activities. All food given is fish or suitable for vegetarians (though not necessarily hechshered). Habonim operates a strict NO NUTS policy on all camps; however, we cannot guarantee that all products used have been produced in nut-free environments. Please ensure you include all dietary requirements and food allergies on the medical form provided. In exceptional circumstances a member of the movement work team will contact you to discuss your child’s requirements where necessary. Please help us keep a nut-free environment by refraining from sending your child with food.